First, wash prawns 2-3 times with water. In that add turmeric and salt mix them, and cut onions as you want. Now take cashew, coconut, coriander and garam masala and grind them, in that mixture mix turmeric and red chili powder mix them and kept aside. Now preheat the oil in a pan, in that add prawns and little fry them and take them out. In a remaining oil fry onion, after frying in that add grind mixture and yogurt, mix them well. Add 1 cup of water and cook it till it converts into viscous. 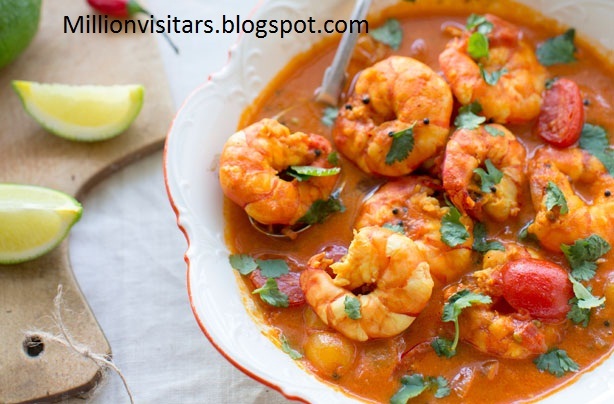 Now add fry prawns and cook for 5 minutes, Add chopped coriander and mint leaves if you want.Here is your hot prawn’s curry is ready to serve.